The small town of Ebensee is home to the last active salt mine in Austria. Given that the town has approximately 8,000 residents and is within the area in Austria with the oldest record of a civilisation, Ebensee has rather little to offer in terms of actual sightseeing. It has the picturesque landscape with nice seaside promenades and mountains that the Salzkammergut is famous for, but the town itself is less appealing than many other towns in the region. Which certainly doesn′t mean that it is ugly - it is simply overshadowed. Ebensee was - like most of the Salzkammergut - part of the Duchy of Bavarian in the early Middle Ages. In the 12th century, it went to Austria and remained there very since. In 1604 the economic rise of Ebensee began with the foundation of the "Saline", the salt mining and processing. By 1625, Ebensee had an impressive 1,000 residents. The town′s economy prospered and beyond salt, it was forestry and the supply of the people that lived on the mining that added to its wealth. With the rise of tourism in the Salzkammergut in the 19th century, Ebensee started to benefit from this new source of income, too. Otherwise, the remoteness of Ebensee ensured that dramatic events happened elsewhere - until 1943, when the Nazis noted this very remoteness and chose Ebensee as a production and research site for their V-missile program. By this time, the original test site in Peenemünde had become the target of allied bombers, and Ebensee was hidden deep in the Alps beyond reach of the bombers. In November 1943, a side-branch of the concentration camp Mauthausen was opened. Some 16,000 inmates were liberated by advancing US troops in the very last days of WWII in Europe, on the 6th of May 1945. The camp was then used as a shelter for "DPs" (displaced persons), but following quarrels between Jewish and Polish former inmates, the Jewish ones were transferred to Bad Gastein in the south of Salzburg. Today, you can visit the missile-factory mines in a memorial site, the "KZ Gedenkstollen Ebensee" approximately 3 kilometres south of the town. Nearby is a cemetery ("KZ Friedhof") for some of the 8,000 victims of the concentration camp. 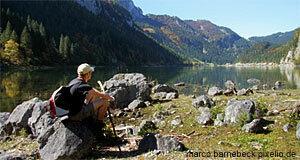 In the surroundings of Ebensee, you can take cable cars to get access to some very scenic hiking routes. This applies in particular to the Feuerkogel and Höllkogel as well as the two Langbathsee Lakes and Lake Offensee. Nearby attractions include Traunkirchen, Altmünster and Gmunden by Lake Traunsee; and Bad Ischl to the South.